Halloween is coming up, and you know what that means…candy everywhere!! What a great holiday. I’ll take any excuse I can to eat more sugar. I have the perfect recipe today to use up some leftover Halloween candy, or to take advantage of the Halloween candy sales that are all over the stores. 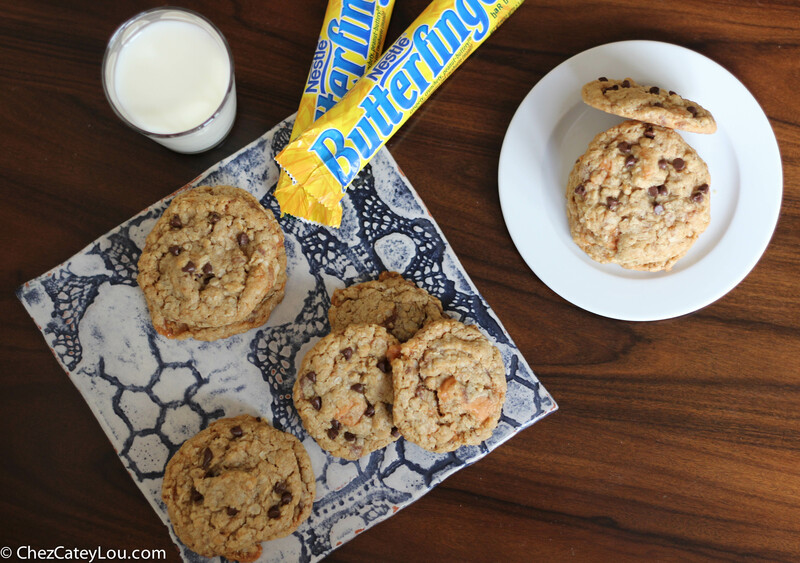 This cookie uses one of my favorite candy bars – Butterfinger. 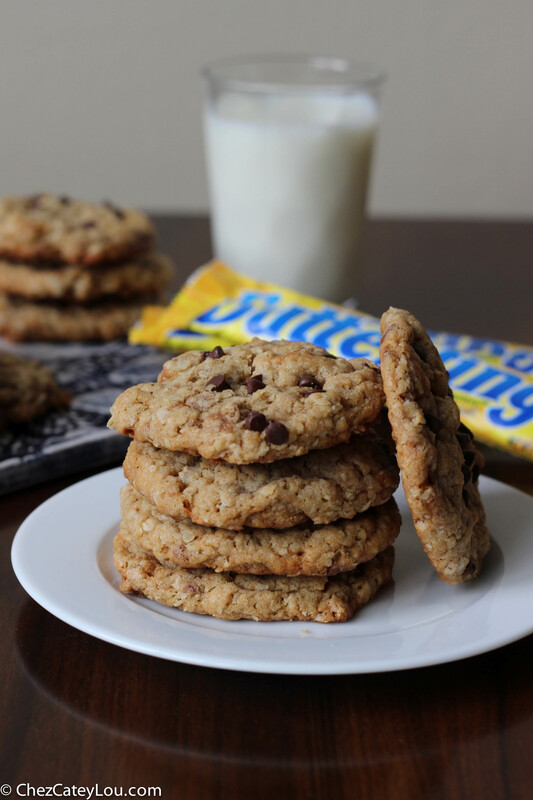 Butterfinger Peanut Butter Oatmeal Cookies. There is a lot going on in this cookie! 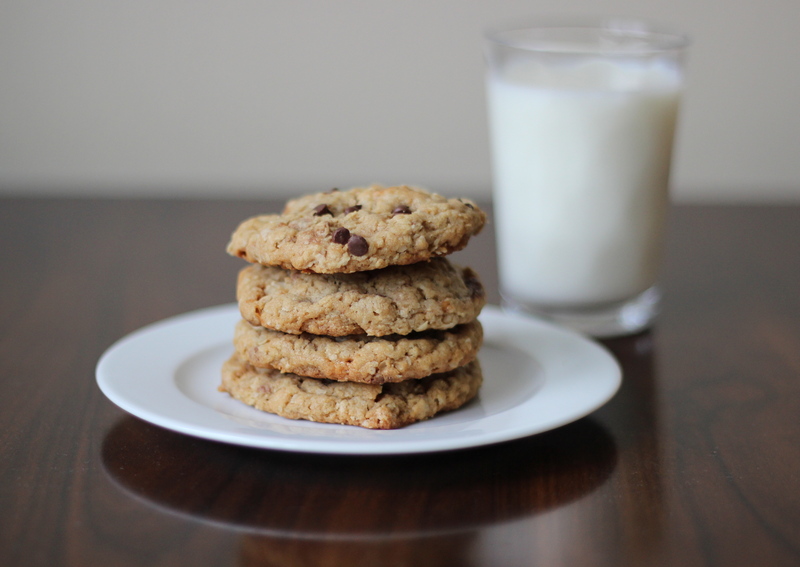 Oats keep the cookies moist and chewy, and give them a really nice texture. There is a great peanut butter flavor from ½ cup of peanut butter. Don’t use natural in this recipe – good ‘ol original peanut butter (I like JIF) bakes up so much better. And of course, the star of the show, the Butterfinger! They add a great crunch to the cookie, and of course have such a delicious chocolate peanut butter-y flavor. I added mini chocolate chips to some of my cookies, just for fun! You can never have too much chocolate. The original recipe from Sally’s Baking Addiction uses Reese’s PB Cups, which would also be delicious. Or try this cookie with any candy bar that you like. 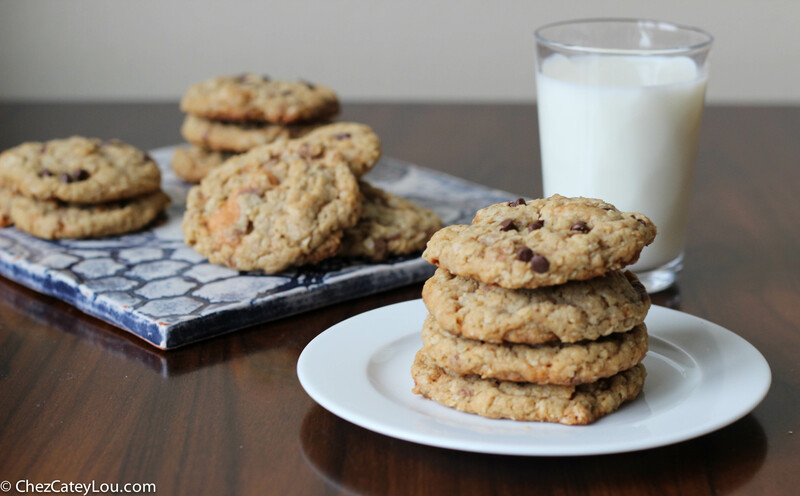 Candy mixed with an oatmeal peanut butter cookie can only result in good things. Preheat oven to 350 degrees F. Prepare 2 large cookie sheets by lining them with parchment paper or a silicone baking mat. In a large bowl, whisk together the melted butter and sugars, until the mixture is completely smooth. Add the egg and whisk until combined. Then add the peanut butter and whisk until fully incorporated. Whisk in vanilla. Using an ice cream scoop or your hands, roll dough (about 3 tablespoons each) into balls. Place 8 on each cookie sheet, spacing them 2- 3 inches apart. Bake for 11 – 12 minutes. The cookies will look underbaked, but will continue to bake on the cookie sheets. Remove from the oven, and let them cool for 10 minutes on the sheet. Then transfer to a rack to cool completely. 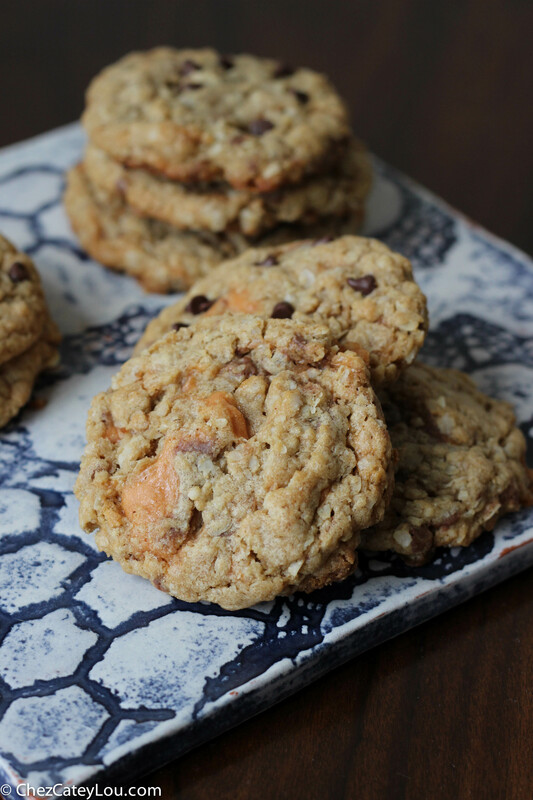 Love the butterfingers in my peanut butter oatmeal cookies! I have to try that some time. Thanks, Sally!! 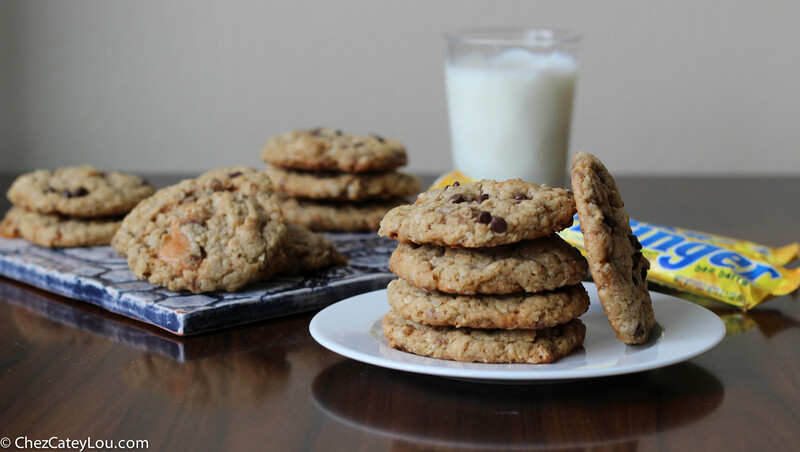 You always have the best recipes – cookie queen for sure! I love these cookies. Candy bars in my cookies = heaven!! And you are so correct..Sally has the best cookie recipes! Love your adaptations a lot! Thank you! I definitely see a lot of candy bar cookies in my future – the possibilities are endless! Oh my gosh, these look too good for words. I feel like Butterfingers are one of those candy bars that I’ve had too few of ever since I stopped going trick or treating at Halloween / left grade school. I was just thinking about how I missed them the other day — need to make these! Thanks for the wonderful recipe! Thank you! I rarely eat candy bars anymore, so this cookie definitely brought back memories of childhood trick or treating! These cookies look amazing and delicious! Thanks! I think these would be so good with pretty much any candy bar! I am really going to have to make these for my mom – it’s her favorite candy, favorite cookie and favorite breakfast all rolled up into one! Looks fantastic! 😀 wish I could get butterfingers in the UK. I’ll have to try with another chocolate bar. Great minds think alike 😉 Your cookies look fab! Ha they sure do! Thanks for stopping by!